3.695,80 € прибл. 265.993,75 руб. The Antelope Goliath is an USB, MADI and Thunderbolt audio interface with a huge amount of channels and connectivities. It suits in big audio recording application like recording a band in a studio. The audio record made with this audio interface are very high quality and can be monitored latencyfree. Moreover a talkback function is on board so you can speak with your vocalist or instrumentalist while recording. The Antelope Goliath offers 64-channels via Thunderbolt, 32-channels via USB, 124 MADI and 24 AES / ADAT channel, all with samplerates of up to 192 kHz. So it guarantees excellent audio recording quality with a high amount of flexibility connectivitywise. 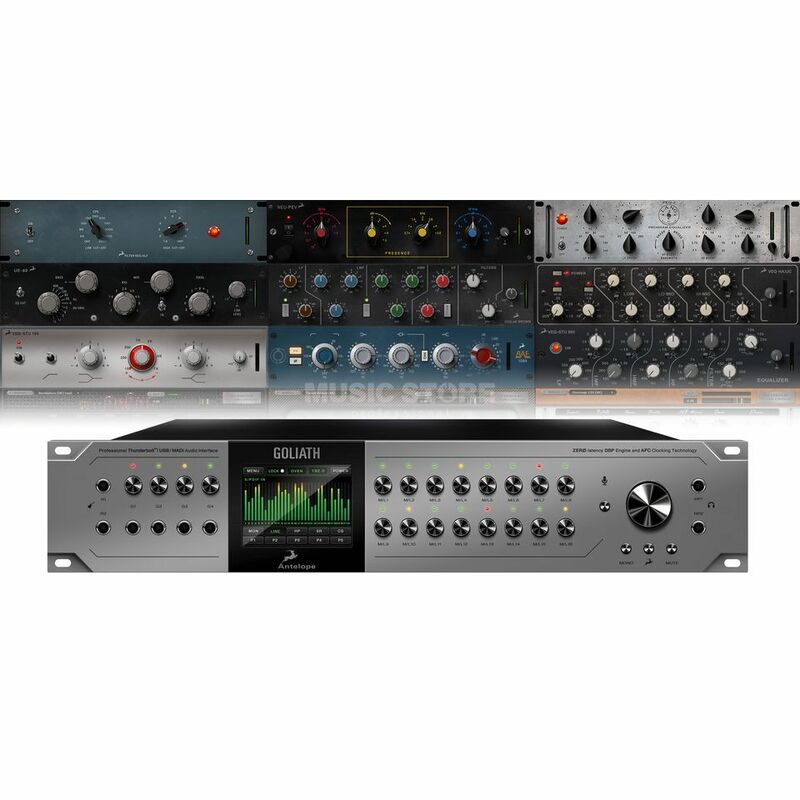 Furthermore it is equipped with 32 analog ouputs and 36 analog inputs, among them are 16 microphone / line inputs with the outstanding Pristine mic preamps of Antelope and switchable phantompower. The 4 instrument inputs are placed in front of the device and can be substituted with the mic inputs 1-4. The monitoring options of the Antelope Goliath truely shine in terms of quality an can be used thoughtlessly for every mastering application. It offer two individual controlable headphone outputs and an excellent stereo monitor output with 129 dB signal-to-noise ratio. Moreover the Goliath audio interface provides one of the famous Antelope Wordclocks. This comes with one input and two outputs with a precision of +/- 0,02 ppm. To all the amount of features come the excellent soundinghardwarebased effects and amprooms. Among them are vintage effects, guitar amps and cabinets. The display in front of the Goliath is not just for visualization, it is also a touchscreen with which you can control volume or other settings. Additionally the Antelope Goliath is controllable via iPhone and Android App.